Give Your Heart a Break! In February, Valentine’s Day often turns hearts toward amorous pursuits, but February also is Heart Month, the perfect time to focus on heart health. Cardiovascular diseases (disorders of the heart and blood vessels) are the No. 1 cause of death worldwide. Coronary heart disease (CHD), one type of cardiovascular disease, is the leading cause of death in the UK, resulting in approximately 73,000 deaths annually. 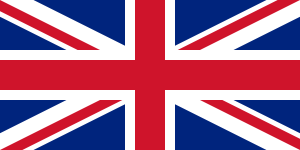 About every 7 minutes, someone in the UK dies from CHD, including approximately one in six men and one in 10 women. Fortunately, the risk of heart disease can be reduced with positive lifestyle changes, such as quitting smoking, making dietary modifications, and being physically active. To help your audience understand why these changes are important, Health Edco has a wide range of engaging teaching tools that can inspire people to take charge of their heart health and, rather than break their hearts, give their hearts a life-saving break! 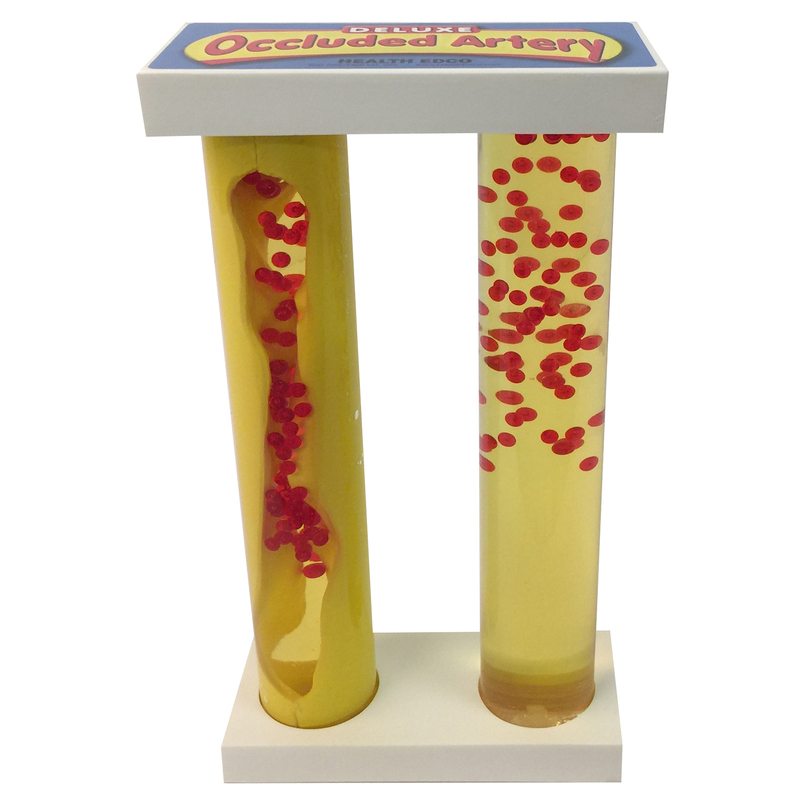 One of Health Edco’s most popular heart health education resources, the Deluxe Occluded Artery Model provides viewers with an interactive, easy-to-understand demonstration of the perils of CHD, which occurs when the heart’s blood supply is blocked or interrupted because of cholesterol buildup in coronary arteries. One half of the model depicts a healthy artery, while the other side depicts an artery clogged with thick yellow plaque. By flipping the display upside down, viewers can watch as blood cells easily travel through the clean, healthy, unobstructed artery on one side. In sharp contrast, blood cells get trapped in the unhealthy, cholesterol-encrusted, atherosclerotic artery on the other side, mimicking the obstruction of blood flow in coronary arteries that can result in a heart attack. The message of the display is loud and clear: Take steps now to control cholesterol buildup and you may avoid a heart attack later. Another excellent interactive tool for explaining CHD is our Life or Death of a Heart Display. Featuring lifelike, removable models of a healthy heart, a damaged heart, and a blocked coronary artery, the display clearly explains the anatomy of a heart attack. Easy-to-understand text covers why the heart needs oxygen and how plaque buildup in coronary arteries can impede blood flow and cause a heart attack. Viewers can pick up and examine each BIOLIKE 2™ organ model, reinforcing the importance of maintaining heart health. Smoking is a major risk factor for heart disease and heart attack. The good news is that, within a year of quitting, smokers can reduce their risk of CHD to half that of a current smoker. Our Benefits of Not Smoking 3-D Display is a great way to encourage young people not to start smoking, as well as a powerful teaching tool to inspire smokers to quit. Four swivelling panels contrast a benefit of not smoking (healthy skin, healthy and active brain, healthy heart, and healthy lung) with the diseased alternatives: prematurely aged skin, stroke, heart attack, and lung disease. The display explains some of smoking’s devastating cardiovascular consequences: Smoking can cause CHD and sudden heart attacks, as well as artery damage that can lead to strokes. By turning the display panels the lesson is obvious: Don’t smoke or quit now for better heart health. Eating a heart-healthy diet is essential for heart health. For many people, understanding the basics of a healthy diet is an excellent starting point. Our Faux Foods Starter Package is a perfect way to introduce the Eatwell Guide’s nutritional recommendations to pupils, patients, and clients alike. It features 40 realistic food models from each of the Eatwell Guide’s food groups, as well as examples of desserts. The package includes food cards colour-coded by food type that provide nutritional information for each of the 40 foods. The models and the cards make the package ideal for talking about the nutritional benefits of each food group, the importance of practising portion control, and the need to limit overall consumption of sodium, sugar, and saturated fat. Reducing sodium intake can be an important part of a heart-healthy diet because increased sodium consumption is associated with increases in blood pressure. Many people in the UK consume far more than the recommended daily limit of salt for adults of no more than 6 grams—about a teaspoonful—and children should consume even less. Part of the problem is that people need to consider how much salt is already in the processed foods they are eating, in addition to any salt they may be adding from a saltshaker. And even foods that are often viewed as healthy can actually be high in “hidden” sodium. Our Stealthy and Unhealthy Display tackles excess sodium consumption by explaining that even seemingly healthy foods can contain large amounts of sodium. Designed like a large soup can, the display contains a giant saltshaker representing most people’s average yearly sodium intake. Included are two oversized artery models—one healthy and one diseased—that are great for explaining how too much sodium can damage arteries and heart health. Like excess sodium, consuming too much added sugar can harm heart health, and it may increase the risk of dying from heart disease. Sugar-sweetened beverages are a major source of added sugar in many people’s diets, and studies indicate an increased risk in heart attack and heart disease in people who regularly consume sugar-sweetened beverages. It is recommended that people consume no more than 5% of their daily calories from added sugar, but many children and adults in the UK are consuming more than twice this amount. Our Cold Case: The Facts Against Sweetened Drinks Display is a real eye-opener in explaining how easy it is to drink large amounts of added sugar (and calories) without even realising it. 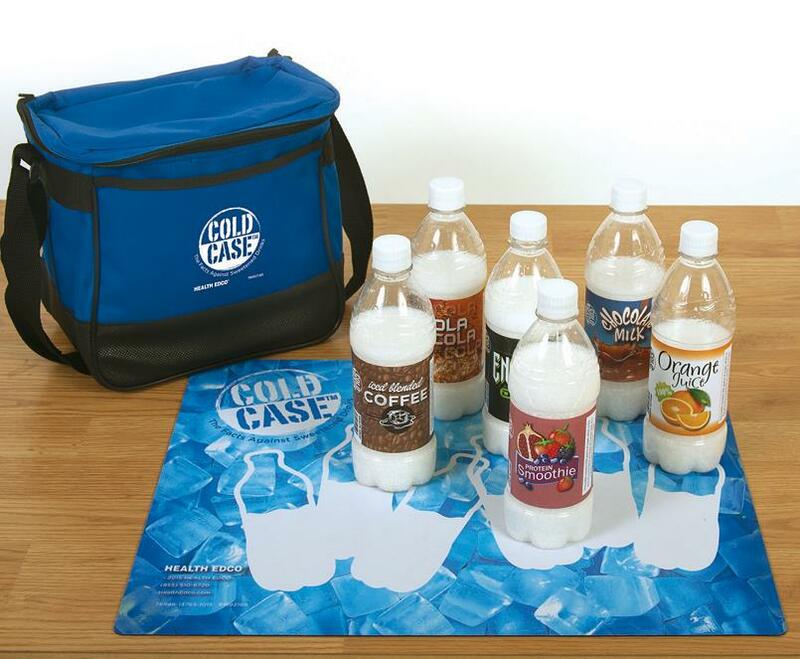 The display features a cooler with six beverage models depicting cola, chocolate milk, orange juice, iced blended coffee, an energy drink, and a protein smoothie. Each weighted model contains the number of grams of liquid sugar consumed by drinking 592 ml of the corresponding beverage every day for just 1 week. The display includes an attractive display mat and presentation notes that explain the connection between excess liquid sugar consumption and its role in the development of heart disease, as well as obesity, type 2 diabetes, and tooth decay. Limiting saturated fat intake also is essential in a heart-healthy diet. It is recommended that the average man should consume no more than 30 grams of saturated fat per day, and the average women should consume no more than 20 grams of saturated per day. Replacing saturated fat with unsaturated fat may help reduce total and LDL (bad) cholesterol. Our Fat Chance: A Closer Look at Fast Food Display is a fun way to discuss the differences between saturated and unsaturated fat and to raise awareness of the high-fat content of many fast foods. 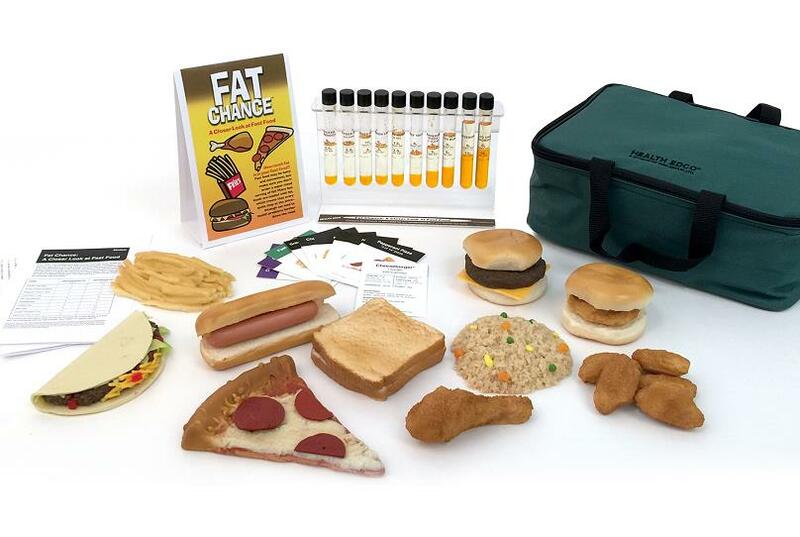 The display features 10 appealing fast food models with 10 corresponding fat-filled test tubes that depict the saturated and unsaturated fat content of each food. Each food model also comes with a nutrition information food card, colour-coded by food type, that provides the fat and other nutritional content of each food. The display comes with an informative tent card and a reproducible handout that explains the differences among saturated, unsaturated, and trans fat, as well as offering tips for making healthier fast food choices. Being physically active is key to heart health. Our popular SpinSmart Physical Activity Wheel is a great way to get audiences of all ages up and moving whilst teaching why physical activity is important. 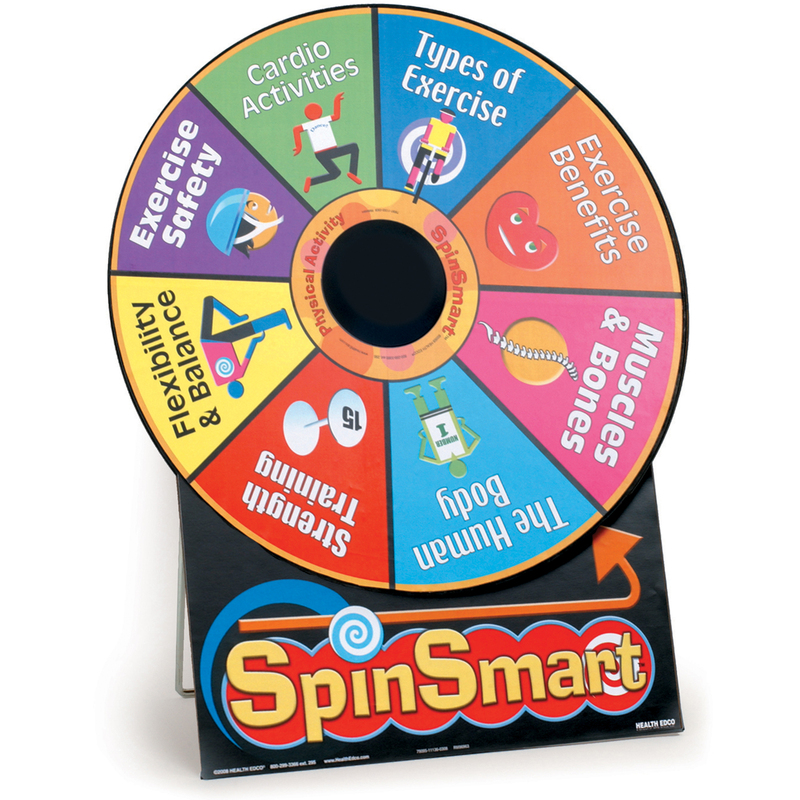 Players spin the wheel and answer questions from one of eight physical activity categories, and they can earn bonus points by performing a specified exercise. The wheel includes a detailed instruction guide with questions for ages 6–10 and for age 11–adult. Living a heart healthy lifestyle means making healthy lifestyle choices. For more resources about heart health and heart-healthy habits, visit our Heart Health, Tobacco, Nutrition, Physical Activity, and Stress Management sections. Healthy habits are the best way to avoid heartbreak and give your heart a break!